Of all the 135,000 odd Olympians since 1896, 330 were born on Christmas Day. 68 Olympians died on this day, and as you would expect, there have been no Olympic events held on Christmas. Among the Olympians born on Christmas, you might remember: Noël Vandernotte, 1936 French rowing coxswain who won 2 medals at only 12-years-old, was born in 1923; Ossi Reichert, 1952-56 German alpine skiier who won a gold and silver medal, was born in 1925; Basil Heatley, 1964 British marathon silver medalist, was born in 1933; and Mary Ellen Clark, US platform diver who won bronzes at the 1992 and 1996 Olympics, was born in 1962. Probably the Olympian with the most connection to Christmas must be Finnish distance runner Kaarlo Maaninka, who was born on Christmas Day in Lapland, about as close as any Olympian birthplace gets to the North Pole. 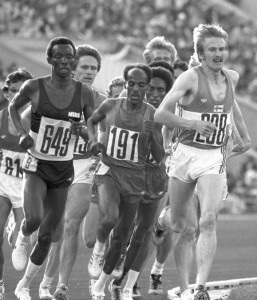 Maaninka won a bronze medal in the 5,000 metres and a silver medal in the 10,000 metres at the 1980 Olympics. Maaninka was born 25 December 1953 in Posio, Lapland in Finland. Lapland, as you surely know, is at 67° north latitude, and only about 5,230 km (3,230 miles) from Santa’s Workshop. Maaninka was a forestry technician and foreman in the Great White North. It is not known if some of the trees he harvested ended up in toys for all the good little girls and boys around the world. He was Finnish Champion in the 10K in 1979, and on the roads, won the Finnish 15 km title in 1978-80. He competed at two European Cups and earned 13 caps in all. His personal bests were as follows: 1,500 – 3:46.80 (1980); 3,000 – 7:58.0 (1980); 5,000 – 13:22.0 (1980); 10,000 – 27:44.28 (1980); Marathon – 2-18:27.4 (1978). So Happy Birthday to Kaarlo Maaninka and to all the 324 other Olympians born on this day. Merry Christmas to all, and from the OlympStats team, to all a good night for 2015.